"I Hope I Get it" "At the Ballet" "Nothing" "The Music and the Mirror" "What I Did For Love" "One"
“A Chorus Line” had the slimmest plot a musical had seen since “On the Town,” but it had a hell of a great idea: 25 dancers desperately auditioning for eight jobs on the chorus line of a new musical. The passion of the piece came from director/choreographer Michael Bennett’s desire to make these dancers represent the thousands upon thousands of gypsies over the years who sublimated their own careers to support the star. “A Chorus Line,” like “Hair,” was developed downtown at the Public Theater, and upon its transfer uptown in the fall of 1975, it caught the public’s imagination. It went on to become Broadway’s longest-running show in September 1983 and continued to run for another seven years. 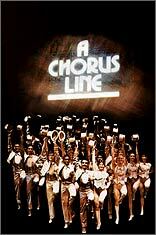 “A Chorus Line” won every prize the theater could offer, including the Pulitzer and nine Tonys, two of which went to Bennett. Marvin Hamlisch and Ed Kleban also won a Tony for their score, which skillfully blended a backbeat rock score with Broadway ballads. The overwhelming success of the show is particularly impressive because “A Chorus Line” ran counter to most every convention the American musical had carefully built up over a century. It had no scenery beyond some mirrors, no real costumes save leotards and a few spangles for the finale; it had no setting other than a nondescript theater, no intermission, and no star. But the show captured the dreams of anyone who wanted — needed — to make it, to prove their worth, to put themselves, like the two dozen dancers, on the line.